Former landgraviate of the German-Roman empire. The only Jews mentioned in documents relating to its early history are those of some parts of Thuringia. After the organization of the county of Hesse, with the capital Hesse-Cassel (1247), and its elevation into an independent principality (1292), individual Jewish families were to be found in many localities. They were "Kammerknechte" ofthe empire, subject to numerous disabilities, taxed, and persecuted, as, for example, toward the end of the thirteenth century at Frankenberg and Geismar, and at the time of the Black Death in many places. Prince Philip the Magnanimous (1509-67) devoted much attention to the Jews in his dominions. In 1524 he proposed to expel them; but in 1532 he again took them under his protection; and in 1538 he praised them for many acts of kindness which they had shown to his non-Jewish subjects in money-lending transactions. In 1539, however, he promulgated a decree to the effect that the Jews should not resist efforts made to convert them; they were forbidden to build new synagogues; and their commerce was restricted. This decree was amplified in 1543 and 1554; and the Jews were forced to listen to Christian sermons. Philip divided his territory among his sons. The divisions that chiefly concern Jews are Hesse-Cassel, Hesse-Darmstadt, and Hesse-Homburg. Sovereign German electorate down to 1866; now incorporated with the Prussian province of Hesse-Nassau. The first regent, Wilhelm IV., the Wise (1567-92), protected the Jews: he annulled the oppressive decrees concerning them, and established the principle of general toleration. His son and successor, Moritz I. (1592-1627), was also tolerant, he protected the Jews in their trade and commerce, and permitted them to engage a district rabbi (1616). During his reign the first "Juden-Landtag" was held. During the regency of Landgravine Amalie Elizabeth severe edicts against the Jews were issued (1646); conversionist sermons were introduced by the state; and a special catechism for Jews was printed (1655). Yet in 1655 the petitions of the cities that desired to expel the Jews were rejected. Landgrave William VI. (1650-63) granted the Jews special concessions, which were renewed by succeeding rulers. From time to time oppressive decrees were issued, relating to the admission of Jews, rights of habitation, acquisition of real estate, commerce, worship, etc. From the seventeenth century the relations of the Jews to the government and their individual and communal life were regulated at diets called by the ruler, which assemblies all Jewish subjects were compelled to attend. A better day dawned with the accession of the German emperor Joseph II. His toleration edict of May 13, 1781, was accepted in Hesse-Cassel and went into force there on Oct. 11 of the same year. The Jews were now permitted to attend public schools and the universities, and to have full rights of settlement and trade. The few remaining restrictions were removed when the electorate became a part of the new kingdom of Westphalia, after the peace of Tilsit in 1807. By a decree of King Jerome Bonaparte (Jan. 24, 1808) the Jews were entirely emancipated: they received a consistorial constitution, and Israel Jacobson was made the first president of their new organization. When the electorate of Hesse was again incorporated with Germany the Jews were once more reduced to the position of protected subjects and were required to pay protection-money. But after the liberal law of Oct. 29, 1833, all Jewish subjects, with the exception of pedlers and petty traders, were fully emancipated. Their favorable religious organization was not altered when Prussian rule began. 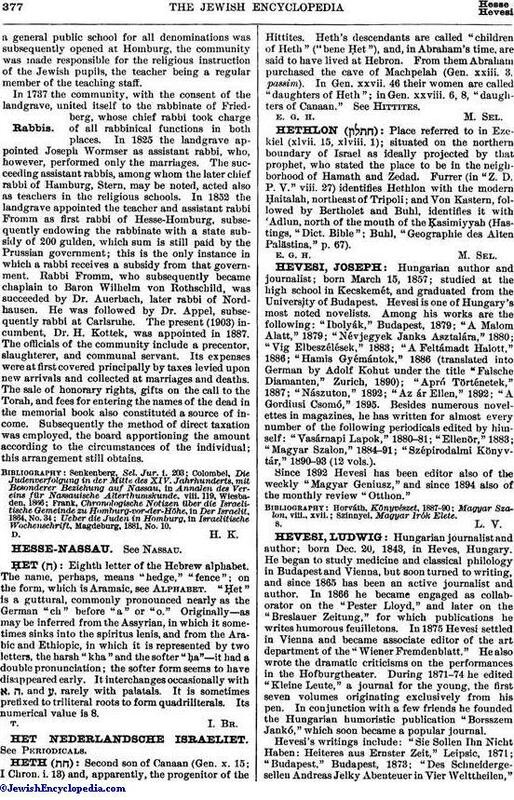 The following district rabbis ("Landrabbinier") deserve mention: Wolf Traube (before 1690); Veit Singer (down to 1734); Hirsch Kirchhain (d. 1779); Joseph Hess (c. 1780); Joseph Michael Kugelmann (c. 1790); Löb. Maier Berlin (c. 1800); Ph. Romann (1836-42); L. Adler (1852-83); and the present incumbent, Dr. I. Prager (1903). The entire district of Cassel, which, in 1903 possessed 17,841 Jews in a total population of 890,069, is divided into the four district rabbinates of Cassel (rabbi, Dr. I. Prager), Fulda (rabbi, Dr. M. Cahn), Hanau (rabbi, Dr. S. Bamberger), and Marburg (rabbi, Dr. L. Munk). Each district is administered by a board of directors consisting of the royal commissioner, the provincial rabbi, and lay delegates; and each circuit has in addition a director. Jewish teachers are represented in the teachers' conferences of Hesse, founded in 1868; there is also a conference of Jewish teachers, founded in 1897. Most of the communities have ḥebra ḳaddishas and the other usual philanthropic societies. Hesse (called also Hesse-Darmstadt after its capital): Renewed Restrictions. Grand duchy; state of the German federation. The early history of its Jews corresponds on the whole with that of the German Jews in general. The ancestor of the house of Hesse-Darmstadt, Landgrave George I., the Pious (1567-96), was no friend to the Jews. He increased the amount of protection-money which they were required to pay, and issued (Jan. 1, 1585) an oppressive decree, similar in many points to that issued by Philip the Magnanimous. His successor, Ludwig V., the Faithful (1596-1626), intended to expel the Jews from Giessen and Marburg; George II., the Scholar (1626-61), followed his father's example, and threatened the Jews of Darmstadt and other places, but at their earnest request he recalled his order of expulsion. On Feb. 20, 1629, he issued a decree adding new restrictions, such as the more rigid enforcement of the oath "More Judaico." Down to about 1778 this decree was renewed from time to time, with added restrictions; for instance, Ernst Ludwig in 1692 and 1732 restricted Jewish worship, enforced the collection of the body-tax and protection-money, considerably increased the tax for admission, and imposed in the form of surplice-fees a tax to be paid to the evangelical clergy ("jura stolæ"). The social condition of the Jews was hardly changed under Ludwig VIII. (1739-68) and Ludwig IX. (1768-90). Besides paying the regular taxes, like the Christians, they were required to pay special taxes, such as protection-money; a tax for admission; the horse, fair, silver, wax, and quill taxes ("Kleppergeld"); and the "dons gratuits," which had to be paid on every change of government. At the request of the Jews a decree relating to dress, taken from the statutes of the electorate of Mayence, was promulgated in 1773, with a view to restraining luxury. In 1783 Jews' diets are mentioned; and in 1785 Jews were ordered to use the German language in bookkeeping and commercial correspondence. With the period of enlightenment a moregenerous spirit swept over Hesse. Under Ludwig X. (landgrave 1790-1806; grand-duke from 1806 to 1830) the "Leibzoll" was abolished, the Jews were permitted to acquire real estate, and the way was paved for emancipation. When Hesse was elevated to a grand duchy after the wars of liberation, the constitution of Dec. 17, 1820, which placed all the divisions of Hesse on an equal basis, granted to the Jews civic liberty. A special edict of July 17, 1823, regulated Jewish education, and another edict of Nov. 19, 1830, organized the congregations. A more favorable edict was substituted Nov. 2, 1841, which in turn is to be replaced by a more timely edict submitted in 1903 by the government to the Diet. In 1847 the disgraceful "moral patent," dating from the time of Napoleon and intended for Rhein-Hessen, was repealed; and after this last restriction had been removed the law promulgated on Aug. 2, 1848, decreed that "a difference in religion entails no difference in political or civic rights." The friendliness which the Hessian grand dukes displayed toward the Jews deserves special mention. As Ludwig I. energetically checked the excesses at the time of the "Hep! Hep! storm" in 1819, so Ludwig IV. and Ernst Ludwig (1903), both in speeches and by special decrees, strongly condemned anti-Semitism. The rabbinate of Darmstadt includes a Reform congregation (rabbi, Dr. D. Selver) and an Orthodox one (rabbi, Dr. L. Marx), while Offenbach with its branch congregations is under Dr. Goldschmidt. The district of Darmstadt is divided into three district rabbinates, or provinces, Starkenburg, OberHessen, and Rhein-Hessen. Alsbach-Bickenbach (central cemetery for 18 congregations); Babenhausen (first mention 1318; persecution 1349); Bensheim (persecution 1349); Biblis; Darmstadt (never had many Jews; in 1903 there were about 1,400, of whom 400 form the Orthodox congregation; many philanthropic institutions, a B'nai B'rith lodge, two synagogues, and religious schools; at the beginning of the nineteenth century the rabbinate was in charge of Alexander Wolff (died Oct. 25, 1843), father of Chief Rabbi Wolff of Copenhagen; then followed B. H. Auerbach, 1835-57; Julius Landsberger, 1859-89; Dr. David Selver, 1889-); Dieburg (persecution 1349); Griesheim; Gross Gerau (new synagogue, central cemetery); Gross Steinheim (persecution 1349); Gross Zimmern; Heppenheim (persecution 1349); Höchst-im-Odenwald; Lampertheim; Lorsch; Michelstadt (down to the end of the nineteenth century seat of the rabbinate; last rabbi Sekl Löb Wormser, a famous cabalist and "ba'al shem," died Sept. 13, 1847); Offenbach (1,212 Jews; a Hebrew printing-office here formerly; Jacob Frank, head of the Frankists, died here in 1791); Pfungstadt; Reichelsheim; Seligenstadt (persecution 1349): Wimpfen (first mention in the 13th cent. ; persecution in 1349). Following are the more important of the congregations in the province of Ober-Hessen, which belong to the rabbinate of Giessen (rabbis, Dr. Sander and Dr. Hirschfeld): Alsfeld; Angerod; Assenheim (first mention 1277; persecution 1349); Bad-Nauheim (first mention 1464); Nidda (first mention 1277); Büdingen (persecutions 1337, 1349); Crainfeld; Friedberg (450 Jews; many philanthropic institutions and foundations; Jews were found here at a very early date, as appears from responsa and other documents; the earliest imperial privilege is dated Dec. 11, 1275, granting exemption from taxes to the Jews who had to pay a tax to the burgrave and his retinue; later emperors confirmed and enlarged this privilege down to 1716; Friedberg suffered greatly during the persecutions of 1337 and 1349 and otherwise; prominent rabbis officiated here, the last of them being Feibisch Frankfurter from Frankfort-on-the-Oder, died Sept. 2, 1841; there is a famous women's bath here, built in 1260, and a new synagogue in the Gothic style, built in 1845); Gedern; Giessen (old Jewish community; persecutions 1349; 875 Jews, 190 of whom belong to an Orthodox congregation; many societies and foundations); Grebenau; Gross Karben; Heldenbergen; Londorf; Müngenberg (in 1188 sheltered the refugees from Mayence; birthplace of the liturgical poet David b. Kalonymus; mentioned in documents of 1277; persecution 1349); Schotten (native place of some rabbis); Wenings. The province of Rhein-Hessen includes the following rabbinates: Alzey (rabbi, Dr. J. Levi; 15 congregations); Bingen (rabbi, Dr. R. Grünfeld; 17 congregations, among which may be mentioned Ober-and Nieder-Ingelheim; I. Klingenstein, founder of the "Achawa," taught at the former place; in the latter there is in the ruins of the palace of Charlemagne a Jewish cemetery several centuries old); Mainz (rabbi, Dr. Salfeld; 21 congregations, including the ancient Jewish community of Oppenheim; existing since the middle of the 13th century, it suffered during the persecutions, especially in 1349; 180 Jews; new synagogue); Worms (rabbi, Dr. A. Stein; 18 congregations). In 1903, in a total population of 1,039,020 in the three provinces of Starkenburg, Ober-Hessen, and Rhein-Hessen, and some enclaves, there were 24,618 Jews. Spiker, Ueber die Ehemalige und Jetzige Lage der Juden in Deutschland, p. 279, Halle, 1809. Darmstadt Memorbuch for 1717 (in possession of Dr. David Selver). L. Löwenstein, Zur Gesch. der Juden in Friedberg, in Blätter für Jüdische Gesch. und Literatur. iv., Nos. 2, 4, 5, Mayence. 1903. Urkundenbuch, pp. 229-500, and from it, Kayserling, Die Juden in Oppenheim, in Monatsschrift, ix. For the persecutions: Salfeld, Martyrologium, passim. 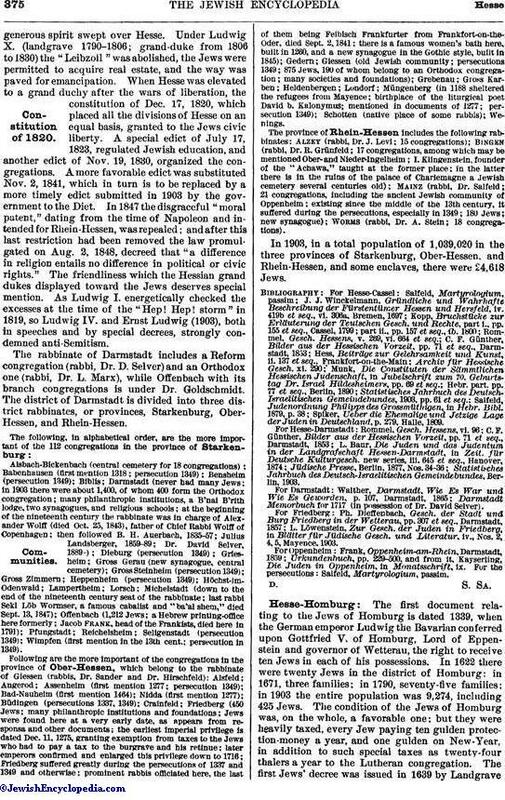 The first document relating to the Jews of Homburg is dated 1339, when the German emperor Ludwig the Bavarian conferred upon Gottfried V. of Homburg, Lord of Eppenstein and governor of Wetterau, the right to receive ten Jews in each of his possessions. In 1622 there were twenty Jews in the district of Homburg: in 1671, three families; in 1790, seventy-five families; in 1903 the entire population was 9,274, including 425 Jews. The condition of the Jews of Homburg was, on the whole, a favorable one; but they were heavily taxed, every Jew paying ten gulden protection-money a year, and one gulden on New-Year, in addition to such special taxes as twenty-four thalers a year to the Lutheran congregation. The first Jews' decree was issued in 1639 by LandgraveGeorg; the second in 1710 by Landgrave Ernst Ludwig; and the third in 1737 by Landgrave Friedrich Jacob. The Jews had no organization so long as they were few in number. They did not even possess the right of prayer in common, which was first granted them in 1684 by Landgrave Friedrich, who appointed the court Jew and factor Zacharias Seligmann supervisor and representative of the Jews, as they had been accused of committing excesses during their ceremonies. He was empowered to impose fines for the transgression of the Jewish law, the money to be turned over to the landgrave; to report any wrong-doing on the part of the Jews; and, finally, to take note of everything happening among them. In return for these duties, and in virtue of his office of court factor, he was exempted from all taxes payable to the landgrave, and had various other privileges. His successor as supervisor was Itzig Bauer, who, however, was not court factor; he also was appointed by the landgrave. As the community had considerably increased in the meantime, the landgrave gave him three assistants as treasurers, who were to be elected by the community. They might make no payments without the consent of the director; they were to take note of all that happened among the Jews; determine punishments in cases of misdemeanor, and report the same to the officials of the landgrave; appoint an efficient precentor; make out and distribute the tickets for the poor; prevent cheating; keep order in the Jewish school; prevent any infraction of the Jewish ceremonies; and they were empowered to punish offenders by fines, in money or in work, and even by excommunication. The treasurers were elected every year, and might be reelected. The first election took place in 1713. In 1737 the number of candidates was increased to six, from whom the landgrave chose three. In 1760 some changes were made in the composition of the board of managers of the community. The landgrave appointed two directors instead of one, and a "heḳdesh gabbai" (director of the shelter for travelers) was elected in place of the treasurers. The Jews at first lived in whatever part of the city they chose, but when Landgrave Friedrich enlarged the city by laying out the Neustadt in 1703, he assigned a certain street to them, which was closed by gates. Although he accorded them various privileges in building up their quarter, the Jews were slow to settle there. In 1816 the ordinance compelling them to live in the Jews' street was repealed. The philanthropic institutions were mainly the same as those in other communities. In early times there was a shelter for the foreign poor, to which any one might be admitted. The expenses for board and lodging were defrayed by individual members of the community, who received tickets stating that on specified days they were each to care for one poor person in their homes or to provide money for his support. The directors had to care for the local poor, and were compelled by the government to do so in case of neglect on their part. The Jews of Hesse-Homburg were very poor, as most of the trades were closed to them. They could work only as butchers, soap-makers, cabinet-makers, tailors, and pedlers, this last occupation affording a meager subsistence to the majority. Commerce in groceries was entirely forbidden to them. There was much call for philanthropy, therefore, and the community had a curious organization of ten philanthropic institutions, which still exist. Jews were also occasionally employed as printers. There was no exclusively Hebrew printing establishment at Homburg, but in 1737 Landgrave Friedrich Jacob established in the government printing-office a department for Hebrew books. Tefillot and maḥzorim principally were printed, and some Jewish scientific works. 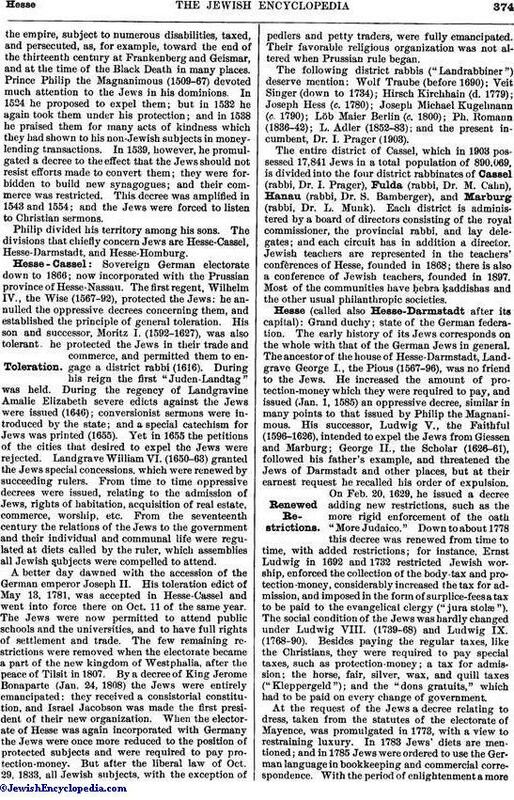 The Jews of Homburg were fully emancipated in 1848, when Landgrave Gustav promulgated the following decree: "In local and state affairs no difference shall henceforth be made between our Christian and our Jewish subjects." This decree was issued in consequence of a petition by the people. In 1853 radical changes were made in the board of directors. 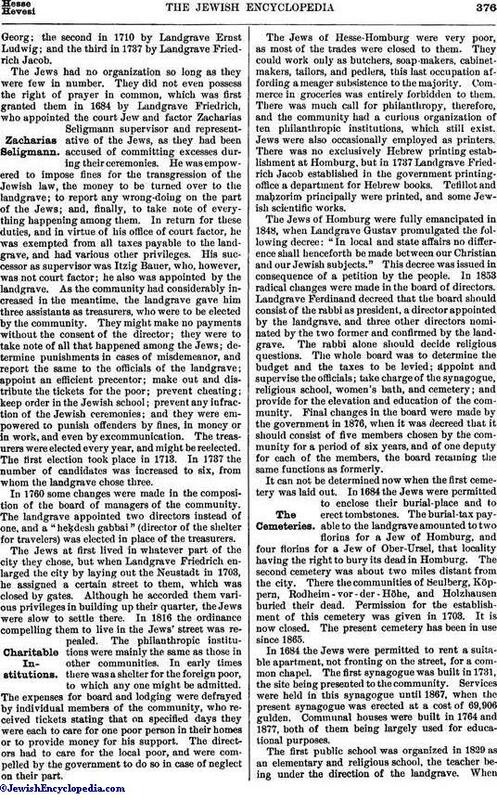 Landgrave Ferdinand decreed that the board should consist of the rabbi as president, a director appointed by the landgrave, and three other directors nominated by the two former and confirmed by the landgrave. The rabbi alone should decide religious questions. The whole board was to determine the budget and the taxes to be levied; appoint and supervise the officials; take charge of the synagogue, religious school, women's bath, and cemetery; and provide for the elevation and education of the community. Final changes in the board were made by the government in 1876, when it was decreed that it should consist of five members chosen by the community for a period of six years, and of one deputy for each of the members, the board retaining the same functions as formerly. It can not be determined now when the first cemetery was laid out. In 1684 the Jews were permitted to enclose their burial-place and to erect tombstones. The burial-tax payable to the landgrave amounted to two florins for a Jew of Homburg, and four florins for a Jew of Ober-Ursel, that locality having the right to bury its dead in Homburg. The second cemetery was about two miles distant from the city. There the communities of Seulberg, Köppern, Rodheim-vor-der-Höhe, and Holzhausen buried their dead. Permission for the establishment of this cemetery was given in 1703. It is now closed. The present cemetery has been in use since 1865. In 1684 the Jews were permitted to rent a suitable apartment, not fronting on the street, for a common chapel. The first synagogue was built in 1731, the site being presented to the community. Services were held in this synagogue until 1867, when the present synagogue was erected at a cost of 69,906 gulden. Communal houses were built in 1764 and 1877, both of them being largely used for educational purposes. The first public school was organized in 1829 as an elementary and religious school, the teacher being under the direction of the landgrave. Whena general public school for all denominations was subsequently opened at Homburg, the community was made responsible for the religious instruction of the Jewish pupils, the teacher being a regular member of the teaching staff. In 1737 the community, with the consent of the landgrave, united itself to the rabbinate of Friedberg, whose chief rabbi took charge of all rabbinical functions in both places. In 1825 the landgrave appointed Joseph Wormser as assistant rabbi, who, however, performed only the marriages. The succeeding assistant rabbis, among whom the later chief rabbi of Hamburg, Stern, may be noted, acted also as teachers in the religious schools. 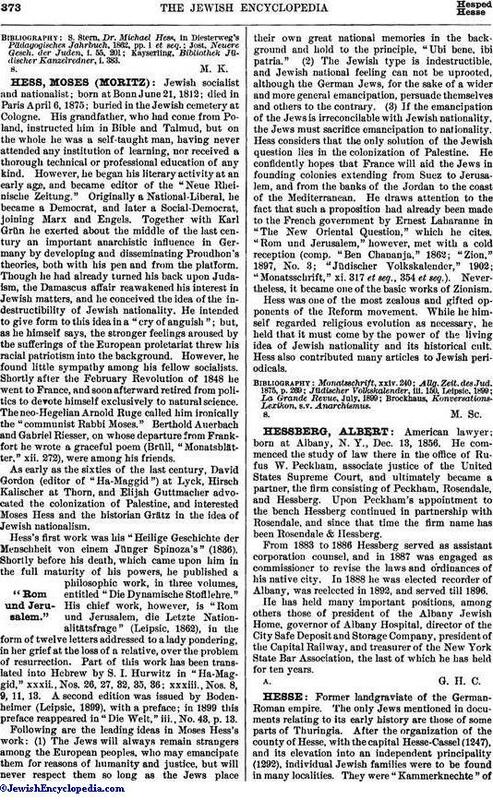 In 1852 the landgrave appointed the teacher and assistant rabbi Fromm as first rabbi of Hesse-Homburg, subsequently endowing the rabbinate with a state subsidy of 200 gulden, which sum is still paid by the Prussian government; this is the only instance in which a rabbi receives a subsidy from that government. Rabbi Fromm, who subsequently became chaplain to Baron Wilhelm von Rothschild, was succeeded by Dr. Auerbach, later rabbi of Nordhausen. He was followed by Dr. Appel, subsequently rabbi at Carlsruhe. The present (1903) incumbent, Dr. H. Kottek, was appointed in 1887. The officials of the community include a precentor, slaughterer, and communal servant. Its expenses were at first covered principally by taxes levied upon new arrivals and collected at marriages and deaths. The sale of honorary rights, gifts on the call to the Torah, and fees for entering the names of the dead in the memorial book also constituted a source of income. Subsequently the method of direct taxation was employed, the board apportioning the amount according to the circumstances of the individual; this arrangement still obtains. Ueber die Juden in Homburg, in Israelitische Wochenschrift, Magdeburg, 1881, No. 10.